When Paul and I started to look into adoption, I had heard stories from other larger women who told me that they had been turned down for adoption because of their size. I was so shocked because I had never heard of this, I honestly thought ''no it can't be true it had to have been because of something else''. 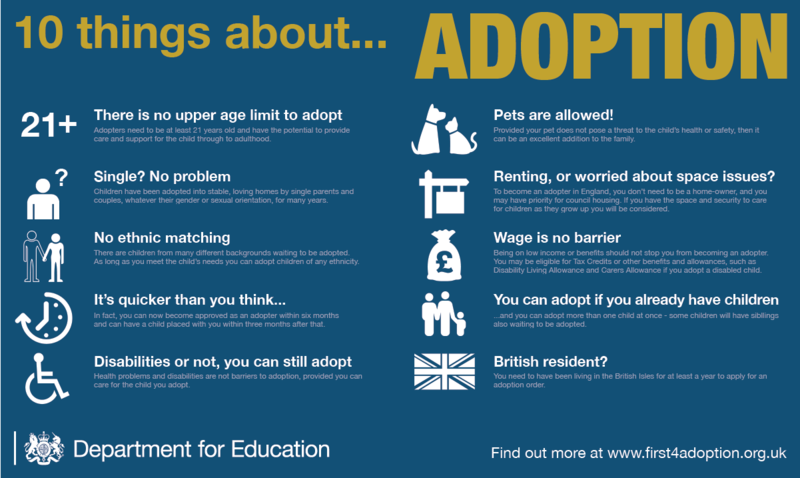 So a couple weeks ago when we contacted a couple of local adoption agencies you can imagine my shock and disgust when I was told that we would have to be working towards a BMI of 40 or below in order for us to be considered as good adoptive parents. All adoption agencies require you to be a fit and healthy person. SO what about me? My current BMI is 42.5 which means I am just out of that range, but what I would like to know is what has my BMI got to do with who I am as a person. The argument around the weight and adoption is that if you are at an unhealthy weight, you will not be fit enough to look after a child. Yes because all of us fatties are the worst of the worst you know we are the spot of the face of humanity and we deserve to not have kids. What about all those fat babes who have children biologically I hear you ask. Well fear not you will not have a doctor burst into your labour room and remove your child. That's right if I could have a child I would be totally fine, I wouldn't need to have a BMI of 40 or less. I could have as many children as possible, but the minute I want to give a child a home, loving parents and a life without social services being involved I need to be a ''healthy'' weight. I am a nice person, my husband is a nice person, we have two lovely dogs, a nice home, we cook from scratch at least 4 times a week. We take our dogs for long walks to national trust locations, we have family close to where we live. One of the best schools in our area is at the bottom of our road and the park is across from our front door. I think these are the things you need to look at for a family, not my weight. I do not think that enough people know that this is going on, it is not made public but this kind of thing is discriminating against fat people. I understand that you need to be able to look after your children, but being fit and healthy is not something you can tell by looking at anyone. Also if it is because they want adoptive parents to run around with their children, what about parents who are in wheelchairs? This whole thing makes me angry. I can't say more then that, I am so mad about this. I am a good person and all I want is to be a good parent. Why wont they let me? That's a truly disgusting rule! How awful! Being a good parent is nothing to do with your weight. I despair for our society. So many people who could be giving children loving homes and being blocked. This is frustrating and having been through this process myself and also being told I was too fat! Yes those exact words came out of the social workers mouth, when they actually explained to me why this was a ‘thing’, I kind of got it, most of these children have been through unthinkable traumatic experiences and most have permanently lost their parents in one way or another, when a social worker places a child they have to think long term future as these children need to be protected against further loss, obese people are at greater risk of their lives ending earlier. Now please don’t say to me that’s not always the case.....I know it’s not but from a social workers POV they have to think it. I cried for days after they told me this but do you know what it kick started my weight loss and I’m slowly getting there! We were approved as adopters 21 months after we started the process and 8 months after that our beautiful baby girl was placed with us so it will happen it just takes time. Every time I see that social workers name on any document I want to tell her how wrong she was for calling me fat that day but deep down I understood why! So please I know it’s frustrating and you’ll be angry for a fair bit but don’t let that sto you from doing the most rewarding and wonderful things in the world!